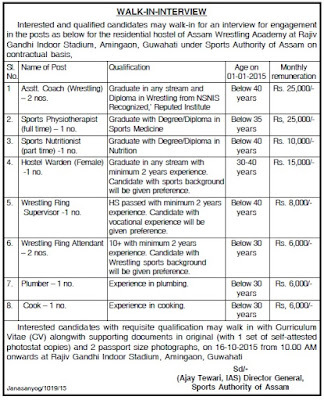 Interested candidates may walk-in for an interview for engagement in the following posts for the resident hostel of Assam Wrestling Academy at Rajiv Gandhi Indoor Stadium, Amingaon,Guwahati under Sports Authority of Assam on Contractual basis. Qualification: Graduate in any stream and Diploma in Wrestling from NSNIS Recognized institute. Qualification: Degree /Diploma in Sports Medicine. (a) Graduate in any stream with minimum 02 years experience. (b) Candidate with sports background will be given preference. Qualification: HS passed minimum 2 years experience.candidate with vocational experience will be given preference. Qualification: 10+ with 2 years experience.candidate with Wrestling sports background experience will be given preference. 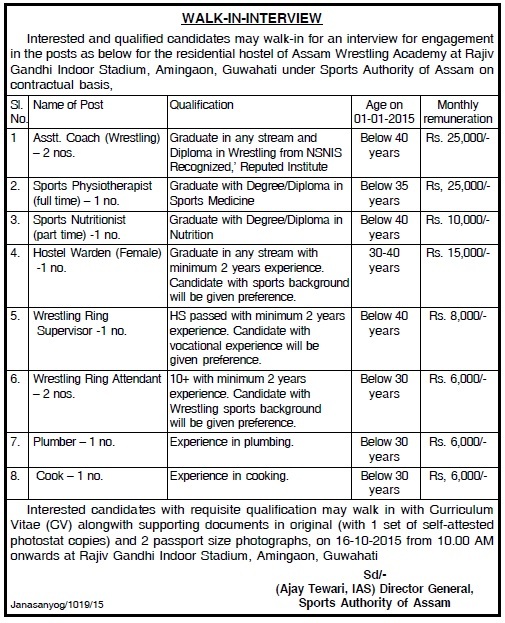 How to Apply: Interested candidate with requisite qualification may walk in with CV along with supporting documents in original (with 1 set of self attested photostat copies) and 2 passport size photographs on 16-10-2015 from 10:00 am on wards at Rajiv Gandhi Indoor Stadium ,Amingaon,Guwahati.